Why a balanced antenna matching unit? Everyone calls them tuners, including the manufacturers. But they don’t tune, they match. For this article I will call it a tuner; however it is actually an impedance matcher. It is used to cancel reactance, both inductance (+j) and capacitive (-j). Antenna tuners are much like shovels. It takes more than one kind of shovel to perform a variety of jobs efficiently. For example, a snow shovel isn’t suitable for digging holes in hard ground. A tiling spade could be used to shovel snow, but it wouldn’t be very efficient. Similarly, no antenna tuner circuit can do every antenna-matching job extremely well. A balanced-load tuner should be designed from the ground up for the job that it is intended to perform. This article describes a circuit that does a superb job of feeding an open-wire transmission line such as ladder line or window line. It cannot be used for unbalanced loads such as coaxial transmission line or for end-fed antennas. Now that we have so many bands below 30 MHz, an open wire-line center-fed wire antenna systems looks even more attractive than it did when such antennas first came into popular use in the 1930s. Taking advantage of this versatile antenna system requires a box that will interface the 50 ohm unbalanced output of today’s transceivers to the highly variable impedance (Z) of the balanced feed points of multiband antennas. Many makers of antenna tuners claim their circuits can operate into an unbalanced load or a balanced load such as ladder line. 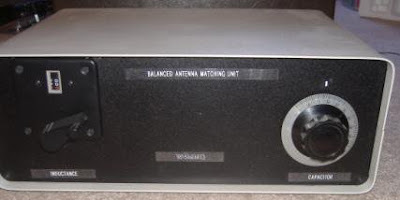 Actually most of the contemporary “matches everything, balanced or unbalanced” antenna-tuner circuits produce a semi-balanced output when used with a balanced load. Although the antenna will radiate in this situation, a semi-balanced output is like having a semi-balanced checking account. It is less than wonderful. A look at the schematics for the contemporary “matches everything” antenna tuner circuits reveals they are usually unbalanced, high-pass-filter-characteristic, T networks with a voltage balun hooked to their unbalanced outputs. This is a compromise performance when used with a balanced load. The imbalance in these “balanced” tuners can be easily confirmed with an RF voltmeter or RF ammeter(s). The actual current or voltage at each output terminal is progressively more imbalanced above 7 MHz. At 28 MHz, it is not uncommon to have 50% more current or voltage in one of the legs than in the other leg. Some may ask, “Why not use the same balanced tuner design that was popular in the 1930s?” As many old-timers know, the 1930s-era balanced tuner consisted of a resonant (or near resonant) center link coupled tank circuit with moveable taps on the secondary. For each band change, the taps had to be moved and reopitmized, the total inductance changed and the tuning capacitor retuned. Changing bands was labor intensive! These tuners were seldom built in enclosures, because near-constant access to the taps and the inductor(s) was a necessity for changing frequency. It was a common practice to build these tuners on a breadboard for maximum accessibility. In the 1950s, the E.F. Johnson Company marketed its Matchbox series of balanced antenna tuners. These tuners used the same center-link coupling arrangements as the earlier tuners but they eliminated the movable-tap arrangement by using a double differential capacitive voltage divider across the tank inductor. (A differential capacitor is the RF equivalent of a potentiometer dc-voltage divider.) This allowed the operator to increase and decrease the voltage fed to the antenna electrically, without changing taps. The Johnson circuit worked, but the Z-matching range was severely limited. Frequently, the SWR could not be reduced to a satisfactory low level. The 1:1 current balun solves the capacitive imbalance problem of the 4:1 voltage baluns used in the output side of conventional tuners. The bottom line: high impedance baluns are a very likely source of grief no matter how carefully they are engineered and constructed. All of these problems are easily avoided. The solution is simple – don’t put the balun in the highest-impedance part of the circuit. Instead, put the balun in the lowest-impedance party of the circuit (in most cases, the lowest-impedance part of the circuit is the 50 ohm coax input to the antenna tuner), and build a balanced L-network tuner for the balanced output of the low impedance balun. So, why have we been putting the balun in the wrong part of the circuit for all these years? Building a no-grief 1.8 to 30 MHz 50 ohm balun is easy. 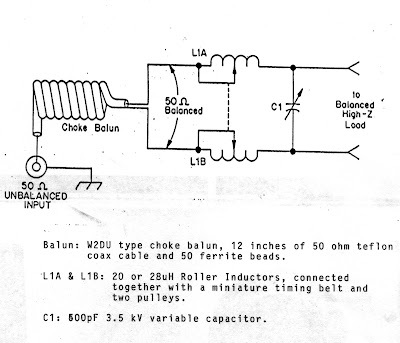 You can build a Walt Maxwell W2DU type choke balun. Use 12 inches of 50 ohm Teflon coax cable and 50 ferrite beads, now available in kit form from the Wireman. The balanced network consists of two 20 or 28 uH roller inductors connected together with a miniature timing belt and two pulleys, a counter dial and 40 to 500 pF 3.5 kV Variable capacitor, and a 50 ohm current balun on the input side. See the pictures of the outside and inside of the balanced matching unit for the layout of the parts. I will give all credit for what I have learned about the Balanced Matching Unit to my friend Walt Maxwell, W2DU. Walt is the author of the book Reflections and I recommend the book. It should be in every ham shack. Ed Bigbie received his Amateur License in 1946. He has been a member of ARRL since 1946 and QCWA since 1975. He received his First Class Phone License with Radar Endorsement in 1945 and has been an ARRL Technical Specialist since 1996. Ed was a Senior Member of the Institute of Radio Engineers (IRE) until it merged with The American Institute of Electrical Engineers (AIEE) and became the Institute of Electrical and Electronics Engineers (IEEE). Ed is currently a Senior member of IEEE and a Senior member of The Society of Broadcast Engineers (SBE). He is also a charter member of the Association of Communication Technicians (ACT). Ed has been a Registered Professional Engineer (PE) in the State of Georgia since 1965 and has authored several articles on antennas, transmission lines and matching units. He runs two IC-756PROIII, a IC-PW1 amplifier and an 811H amplifier. You can find him on 3.995 every morning from 4:00 AM to 7:00 AM Eastern time and occasioanlly on CQ100. Listen on 3.995.